May's selection for the tween book club was Gordon Korman's Unsinkable. I've been a fan of Korman since I was a teenager myself and I knew the kids would love to read the first book in his Titanic series. They even noticed right away that the three cover photographs together show a complete image of the Titanic! As far as what we did, we talked about some general book discussion questions. 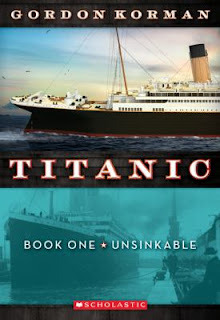 I followed Abby the Librarian's suggestion to use the book 882 1/2 Amazing Answers About the Titanic to share some trivia. We also did a Titanic crossword puzzle I found. I pulled a lot of our Titanic books and let the attendees go through them and share anything they found interesting. Unfortunately this program was held during that big storm on Monday evening, so we had a small turnout and most of the girls who came were not able to finish the book. But we spent a lot of time just talking and I think it was still a fun time for them. I am really enjoying getting to know these young ladies! This was our last meeting until September, but luckily they will all be joining me again in the fall. If you have any ideas for a book that would be fun for us to read in the next school year, please suggest it in the comments! We usually read paperbacks and the program is open to kids in grades 4-6.